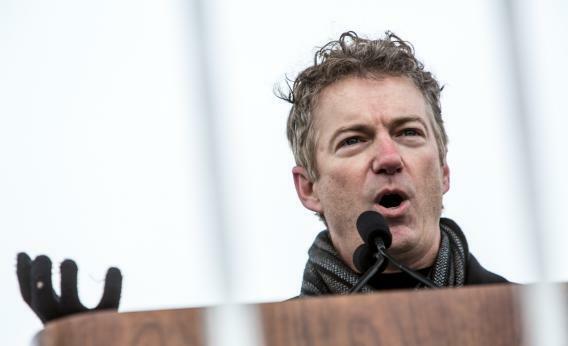 Sen. Rand Paul (R-KY) speaks at the March for Life on January 25, 2013 in Washington, DC. After giving a 30-minute foreign policy speech at the Heritage Foundation, Sen. Rand Paul invited reporters onto a conference call to chew over the details. The speech itself was a robust defense of realism and containment, including a nod toward the idea that anti-Hagel campaigners have howled about all week—the possibility that a nuclear Iran could, in fact, exist and be lived beside. BuzzFeed’s Rosie Gray asked whether this meant Paul had decided to support Hagel. Paul remained undecided. I asked whether Paul would need to know anything in particular before voting on Hagel or CIA nominee John Brennan, because plenty of Republicans have held up nominees over smaller issues than drone warfare. Paul simply wasn’t ready to discuss the filibuster that way—he’d voted for John Kerry, after all, and he agreed with him on maybe “1 percent” of issues. But before tomorrow’s Brennan hearing gets underway, Paul had lots of outstanding questions about drone warfare.